Smoke Detector is the 2nd Charlie Salter mystery, set in Toronto, Ontario. Salter is a member of the Metropolitan Police, but has not been given any interesting cases in the last year or so as a result of political changes in the department. In this story, he is assigned to an arson / homicide case because everyone in Homicide is too busy. Cyril Drecker was the owner of an antique store who died when the building burned down. The investigation is probably much more realistic than most in crime fiction, with Charlie hunting down clues, interviewing persons involved with the man who died, and sending his sergeant to follow up other leads. Not a lot of action or tension. The suspects are all very interesting: Drecker's current girlfriend, Drecker's wife, his assistant in the antique business, and several people he had done business with recently. There were many facets to this book. This is as much a book about Charlie Salter the man, husband and father, as it is about a murder investigation. He and his wife have two young sons, an 11-year-old and a 14-year-old; his wife has just started working outside the home and he feels threatened. Charlie has a follow-up medical test necessitated by a recent annual exam, which has him worried. This is a story about a real-life policeman. I also learned about the internment of Japanese Canadians in Canada after the attack on Pearl Harbor. A side story features one of the suspects, an elderly Japanese gentleman, Gene Tanabe, who has disappeared after the murder. He was interned during World War II and had left a box of Japanese prints with a friend who held them for him for many years. This box (pictured on the front cover of my edition) then turned up in Drecker's shop and Tanabe had purchased it from Drecker shortly before the fire (minus the prints). This novel features nice characterization and an interesting story that pulls you in, even if it moves a bit slowly. The setting of Toronto in the early 1980's is also well done. Trying to figure out who the culprit was, I was divided between two suspects, and then it turned out to be someone I had not considered... but the solution made sense, it did not come from out of left field. There are eleven books in the series, and I will be reading the third one, Death in the Old Country, which won the Arthur Ellis Award for Best Novel in 1986. I liked it too. It's a good series. I agree, Rick. I am looking forward to reading no. 3 in the series. I'm so glad you reviewed this one, Tracy. I'm happy to see you enjoyed it, and you've reminded me that I need to catch up on the series. I want to put one of those novels in the spotlight, too. Absolutely, Margot, one of Eric Wright's books would be a great candidate for the spotlight. Not heard of author or series, and then noticed the date: back in those days it was much harder to keep up with great crime fiction from other countries, don't you agree? This sounds very interesting, will look out for it. Very true, Moira, much harder back then to learn about different authors, and especially in other countries. I only heard of Eric Wright when I began reading Canadian mysteries for the challenge a few years back and someone recommended his books. Tracy, I hadn't heard of the author or series either. I have hardly read crime/mystery fiction (not counting espionage) set anywhere in Canada. I had not read many Canadian authors before I started blogging, Prashant. I am glad to have learned of the Canadian authors I have tried. Sounds good. Brian Busby can tell you a lot about the internment that took place in Canada. I like many Canadian authors. My favorites are Margaret Millar and Margaret Lawrence. I will have to ask Brian about the internment of Japanese in Canada, Patti, and see if there are books about that. I do like Margaret Millar a lot too and I need to read more of her books, I have plenty of them already. I looked up Margaret Laurence and I can easily get a copy of The Stone Angel (or other books by her). I will do that. This series sounds like a winner, Tracy. I prefer procedurals to the puzzle mysteries and hardboileds. I like to start a series at the beginning. I'm hoping there are ebook versions. You have a point there, Mathew. I always say I like police procedurals because it is logical for them to be investigating a murder, unlike amateur sleuths. But maybe it is because those books are not so puzzle oriented. 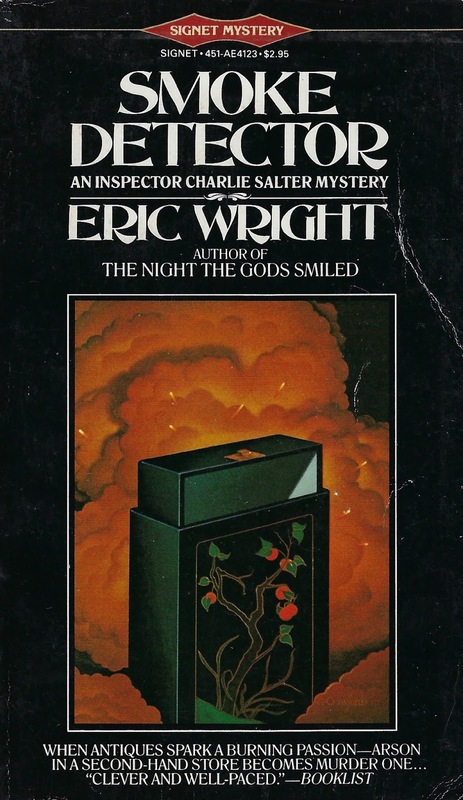 The only kindle version I know of for Eric Wright books is an omnibus of his first three books, which is a good start. Thanks, Tracy. I downloaded the omnibus! Great, Mathew, I do hope you enjoy the novels. I never knew that Canada had interned Japanese Canadians during the war. It shows how little I know about the country. I think I can probably pass on this book and author - too much already. If I had thought about it, Col, I would have assumed that they did because it happened in the US too. I do plan to find more information about that.